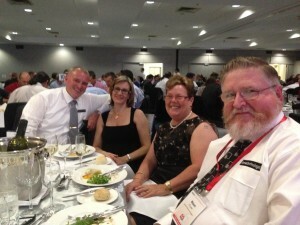 Earlier this month James Technologies was very proud to attend the 25th Mine Electrical Safety Association (MESA) Annual conference, at the Pullman Brisbane King George Square Hotel, Brisbane Queensland. 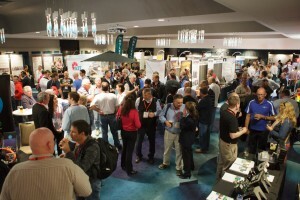 The event brought together more than 340 Delegates from Government Departments, Consultants, Suppliers and key industry decision makers within the electrical field to hear technical presentations on all matters relating to electrical safety within the Mining industry. During the conference a closed trade exhibition is also conducted for the benefit of the delegates. James technologies was the dinner sponsor for the event and we were very pleased to secure the great ‘Col Elliott” as the Entertainment for the evening, which is an understatement. Col had the whole crowd in stitches. The formation of the MESA was the first of its kind in Queensland, being established well before the industry focus on safety. 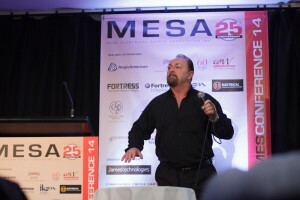 For past 25 years the MESA Association or MESC (Mine Electrical Safety Committee as it was originally know as) has been an integral conduit between the working face of the industry – suppliers and government legalisation departments in identifying electrical safety problems and by consultation, provide information with a view to improving safety and productivity. 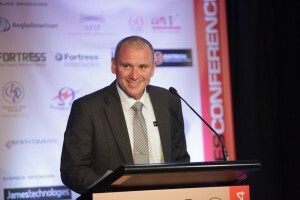 We look forward to seeing you at next years conference.